It’s the second year in a row that Anna Strumba MD, a West Bloomfield/ Novi pediatrician and lactation consultant, has been recognized as one of America’s Most Compassionate Doctors. The award is based on patients’ reviews. “While physicians generally receive positive feedback from their patients, only a select few receive praise about the compassion that accompanied their care… Of the nation’s 720,000 active physicians, less than 3% were accorded this honor by their patients in 2011,” Vitals.com, who tabulates this award, says. 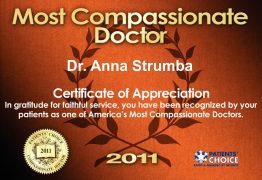 The Compassionate Doctor Recognition crowns the list of four other professional and patient awards that Anna Strumba received earlier in 2011: Patients’ Choice Award by Vitals.com, Mom-Approved Doc by Metro Parent Magazine, Continuing Medical Education/ Continuing Professional Development Award by the American Academy of Pediatrics, and Physician Excellence Award by the medical staff of St. John Providence Health System. Anna Strumba MD, FAAP, IBCLC, is a board-certified pediatrician at West Bloomfield Pediatrics in West Bloomfield and Novi, and an internationally certified lactation consultant at Providence Hospital’s Outpatient Breastfeeding Clinic in Southfield. She can be contacted via her web site DoctorStrumba.com, or at Facebook. ANNA, MAZAL TOV!!!! what an honor!! I hope you are proud, you should be!!!! Congratulation!!!!!! You are the best doctor. I recommend you to all my friends.